It is the ‘in word’ right now, but sustainability shouldn’t be treated as a passing fad. More consumers are seeking venues that will give them the feel-good factor, while businesses have to be more aware of their environmental impact in a bid to better protect the planet. There are three areas the Sustainable Restaurant Association (SRA) is focusing on in the coming months to make the biggest positive environmental impact, which are also, when done well, likely to lead to impressive business gains. It all may sound dull or over-hyped, as the words sustainability and environmentally friendly are bandied around so frequently and, in many cases, without proper understanding. As well as, potentially, being overused, the words can become monotonous and may conjure up images of tree-hugging hippies. Those in that frame of mind, however, should quickly reconsider, as sustainability is a very serious matter and, in recent years, has been given the business treatment. From politicians, to the leaders of blue chip corporates, almost all see the vital importance of getting it right by making changes to the way their companies operate… or face the consequences. “There’s a lot of progress on the pub and bar sector. We’ve got a couple of dozen pub members now. In terms of the status of sustainability in the pub trade, there are a few things that are going well and give us reason to be cheerful,” he explains. Although Stephen highlights these as three significant areas of gain for pubs, when making a positive environmental impact, he does say the sector has a lot to be proud of. For instance, the trade has pretty much led the way in cutting and reducing single-use plastics, particularly straws; more pubs are now working with sustainable fish suppliers; while five pubcos are ranked among the Soil Association’s top 10 food businesses offering healthy and sustainable children’s food menus. The SRA has been around for almost a decade and began life when, in 2010, founders Raymond Blanc, Giles Gibbons and Mark Sainsbury, among others, got together to make a change in the hospitality sector. The combination of restaurateurs joined forces after making the observation that, if you’re running a pub or a restaurant, then you need to consider your sourcing, the environment and the skills used within your business. The big idea behind the organisation was that not everyone needed to go it alone when striving towards the common goal of being greener. For Stephen and the organisation, sustainability can be summed up simply: “It means that we grow rather than destroy the environment. Admittedly it is a lofty measure to work towards, concedes Stephen but, by making incremental steps, great things can be achieved. “The general point would be we need the whole sector to move further and faster on important issues if we’re going to see progress,” he continues. Those big issues – food waste, meat consumption and single-use plastic – are the biggest contributors to greenhouse gas emissions. Livestock production, for instance, accounts for almost 15% of all greenhouse gas emissions, which is more than the transportation sector. The volumes of water needed to produce meat are also significantly high​, at 1.4 gallons for just 1lb of meat, compared with 25 gallons to produce the same amount of wheat. Yet, the SRA does not want the sector to stamp out meat use altogether, nor does it want to become a dictator organisation that ‘bullies’ members into doing what it thinks they should be doing. Far from it, the SRA sees itself as an adviser that offers members and others in the sector help to become more sustainable. “Reducing the volume of meat and making sure food ends up being eaten by customers and not thrown out would be a significant opportunity to address carbon footprints and sustainable issues,” explains Stephen. “So, reviewing menu composition and maybe replacing a meat dish with one veg one and tweaking the weight of meat used in dishes can have a big positive sustainability impact. Also, introducing things like vegan burgers. “Language and position can really help, so simply not having a veggie section on the menu – and incorporating veggie dishes throughout the main menu – increases the sales of these dishes,” he claims. Also, there is a trend towards meat-free eating​. Stephen explains: “A load of people now identify as flexitarian as they reduce their meat consumption. This is an opportunity to service a demand, but also to reach new customers by offering something different.” But also, he continues, there are enough vegans out there now that one in a group of people will dictate where the rest eat. So what are the big myths about becoming more sustainable? That it’s nice to have as an add-on. That it will cost more. Operating sustainably can help the long-term financial sustainability of the business. That it’s just about the environment. People, notably your staff, customers and community, are at the very heart of any sustainable pub. 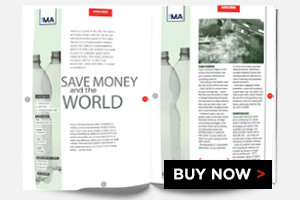 A food waste and general waste audit should be done during busy periods so you can get a realistic measure of what’s going on in your business, according to the The Morning Advertiser’s​ new Going Green guide, commissioned for our Sustainability issue (see p48). The test of a successful waste audit will be whether an operator has been able to understand where refuse is going – is plastic, glass, cardboard and paper all going to recycling and how much food is being disposed of? Simple changes can be made through controlling portions better, ensuring chefs use every element of vegetables, herbs, cuts of meat, etc… And when something can’t be used or has served its purpose, is it going to landfill or in a specialist food waste bin? But why is this all such a big focus these days, when a decade or two ago the majority of consumers and businesses were happily plodding along without a care or thought for their impact on their surroundings? “There’s a growing amount of evidence that something in the way we live and work needs to change. The status quo – in terms of our consumption and food patterns and what they are doing to the health of the planet – isn’t sustainable,” warns Stephen. So what are the benefits of focusing on sustainability? More motivated staff who value the opportunity to contribute to the future of the business and appreciate and respect you as an employer. More efficient ways of operating. Less waste, cheaper utility bills and lower staff turnover can add up to significant savings helping to balance the potential for some increased costs if switching to higher welfare meats, for example. More interaction with customers. Helps create a conversation with consumers who are ever more keen for opportunities to use the power of their appetite wisely. From a consumer perspective, people’s motivations around food choices are being driven by a sustainable agenda, which covers the environment and welfare, he adds. This is being driven by increasing evidence about carbon emissions, greenhouse gases, animal sentience and the likes. Operators starting out on a more sustainable future can start simply with wasting less food or reducing the amount of meat used in dishes or on menus. To bring the message closer to consumers, they can also get involved with initiatives including the SRA’s OnePlanetPlate.org programme. In a nutshell, though, for Stephen and the SRA, sustainability doesn’t have to be difficult and even small steps can help to stand a business and the planet in better stead. Sustainable Restaurant Association head of membership Ylva Johannesson defines what sustainability means in your business, and offers five tips to change the focus of your business to make it more sustainable. 1. Break your proposals down into bitesize chunks to avoid the potential of feeling overwhelmed by the scale of the task. 2. Step back and review where your business is at on those key issues – if possible, measure your position and then monitor improvements. 3. Identify some short-term wins and medium and longer-term goals as part of your sustainability strategy. 5. Involve your suppliers in your sustainability journey – sit down and discuss with them how they can help you meet your goals.